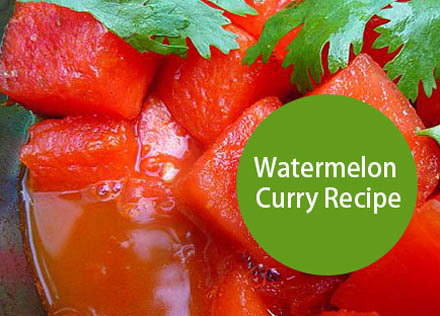 A specialty of the Indian state of Rajasthan, this delicious curry plays the sweet, juicy flesh of the watermelon against a complex background of chiles and spices. Puree 1 cup of the watermelon cubes, chile powder, turmeric coriander, garlic and cumin in a blender until smooth. Pour puree into a large skillet or wok and bring to a simmer. Allow to simmer for about 5 minutes, so that the contents have reduced by about half. Stir in coconut milk and lime juice and continue simmering for another minute. Add the remaining watermelon cubes and simmer until hot through, about 3 more minutes.